It’s fun. It’s easy. It’s Pin Golf! Warm-Up: The games will be announced at the start of warm up time (10 AM), so show up early so you can practice on the games. The goals for each game will not be announced until the tournament officially begins at noon. Entry Fee: Entry is free with Playland Admission. Nachos and Pizza will be provided around 1:30pm. Prizes: Plaques awarded to top 4 expert, top 2 novice and top 2 kids. Also, Gift Certificates, Pinball DVDs and whatever other goodies I can arrange. 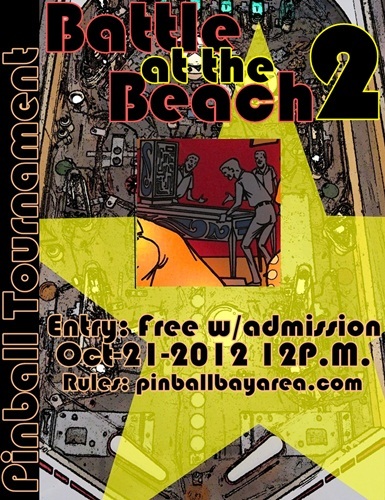 In addition, this tournament will award World Pinball Player Ranking points. Win or lose, you’ll be the only world-ranked pinball player in your circle of friends! Kids: The Kids tournament will not be run on the Pingolf format. Each player plays two designated games two times each. Their highest score on each game is recorded. Players are awarded points depending on their rank. The player with the most points wins! Novice/Open: In Pin Golf, objectives are set on each machine. For example, score 3 Million points on Scared Stiff, or complete the FILM letters on Creature from the Black Lagoon. The player attempts to accomplish each objective with the fewest number of balls (like strokes in golf) as possible. After nine holes, the 8 players with the lowest overall scores play in the Finals. The next four novice players play in the novice finals. Finals will run with a similar format but with only three holes. Full rules on the tournament page. Does anyone know what these guys throw? It doesn’t look like they alywas throw drivers off the tee. Obviously, Nikko is sponsored by Gateway and I don’t know much about their discs. But if Feldberg is using Innova, could someone tell me what he is throwing and how he gets them to fly so far! I see Nikko has an advanced throwing style that may be too difficult for normal humans to do. Feldberg and the swedes throw such smooth and calm backhands and still they fly 400, how?